The Aopoa Nox is a speedy and maneuverable open-canopy racer capable of zipping along planet surfaces or through deep space. Originally designed for Xi’an, the ship was redesigned for Human pilots and made available for the first time in Human space in 2947. Nox Kue: The Nox Kue is the limited version of the Nox features a brushed-silver finish and was specifically created to celebrate the inaugural sale of the first Nox for Human riders. Its name derives from the Xi’an word kue" (SRX) for ‘thrust’. The Nox, like the Dragonfly, is equipped with an anti-gravity drive to allow it to hover about 1 meter above the ground. This allows it to skim over any rough terrain, including water. It can skim over ground at 40 meters per second, or up to 100 meters per second with afterburner. Despite this drive, it cannot transition between ground and space but will require a carrier vehicle. The drive also doubles as a landing gear, allowing the ship to hover at all times with emergency power. The expandable back plate offers additional above protection for the pilot when the ship is activated. The Nox's sleek hull is crafted from lightweight molded carbon composite that provides maximum speed and maneuverability in both atmospheric environments and vacuum. The Nox was first introduced in the late 28th century, it represents one of the most recent additions to the Aopoa lineup. It was designed as a direct Xi'an response to Human open-canopy vehicles such as the Dragonfly. After the ship was introduced into Xi’an culture via a settlement on Oya III, the inhabitants there learned to love riding these Human space bikes. Thus with permission from Emperor Kr.ē, the Aopoa council started designing an open-canopy vehicle which is now known as the Nox. The Nox has been long valued among open-canopy enthusiasts. Because of its Xi’an technology and limited trade restriction between UEE and Xi’an Empire prior to the passage of the Human Xi’an Trade Initiative, they had to search far and wide to get their hands on a Nox, and spend a great sum of credits to rebuild and customize one for human usage themselves. But in 2947, with the passage of the HuXa, Aopoa and the Maiden Group started the sale of the Nox that has been adapted for human usage. On 2947-06-20, a Hull C named the MV Golden Ticket was delivering the first shipment of the human variant of the Nox from Xi’an space to an Astro Armada in the Terra system. During transportation the shipment was attacked by pirates under the leadership of Captain Bane. With the help of law-abiding citizens, the ship was able to reach Terra Prime safely on 2947-06-21, and the Advocacy hunted down and captured these pirates shortly after. The first human-pilotable variant of the Nox was finally made available to the public on 2947-06-23 through Astro Armada, along with the limited edition Nox Kue to celebrate the inaugural sale of the first Nox for Human riders. Unlike many other ships, the Nox was produced by multiple studios. The initial 2D concept of the Nox was created in Foundry 42 UK after which it was passed onto CIG Austin to get the ship flight-ready. There the ship was made by Chris Smith (Lead Vehicle Artist) and tech design was done by Partick Salerno (Technical Artist). Nox is the latin word for night . Before the introduction of the Human variant, the Nox already had a notorious reputation in Hyperion Rally. 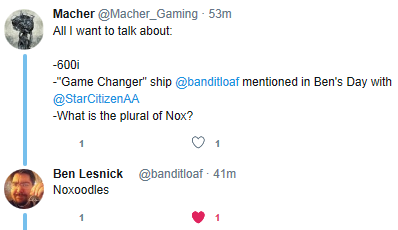 Ben Lesnick once jokingly said that the plural of Nox is Noxoodles.